When he's not seeking out a taste of home or showing his versatility for his club, Weston McKennie eyes opportunity, and more is on the way in the U.S. men's national team's friendlies vs. England and Italy. U.S. men’s national team midfielder Weston McKennie is a 20-year-old living in Germany. Which is to say, when he wants a taste of home, he’s willing to go out of his way for it. Yes, McKennie has brought take-out from the Chipotle in Frankfurt on the nearly three-hour drive back to his boys in Gelsenkirchen (where fellow Americans Nick Taitague and Haji Wright are teammates at Schalke). Yes, he likes to stock up on Hot Cheetos, Sweet Baby Ray’s barbecue sauce and ranch dressing whenever he visits the U.S. military base in Kaiserslautern. And yes, he’ll stop at Chili’s and Popeye’s there from time to time, too. “If you ask any American who lives in Germany, they say it’s the food they miss,” says the Little Elm, Texas, native, whose intensity for pursuing some home eats is matched by his energy on the field as a box-to-box midfielder. Or a center back. Or a wingback. Or even, as we saw against Werder Bremen earlier this year, as a striker. In fact, if you ask McKennie how many different positions he could theoretically play on the field, be prepared for a long answer. That said, McKennie prefers the No. 8 role, which is where you can look for him to take the field in upcoming U.S. games against England (Thursday, 3 p.m. ET, ESPN2, Unimás) and Italy (November 20, 2:45 p.m. ET, FS1, Unimás). These games will likely be the first time we will see emerging U.S. stars McKennie, Tyler Adams and Christian Pulisic on the field together at the same time with the senior national team. 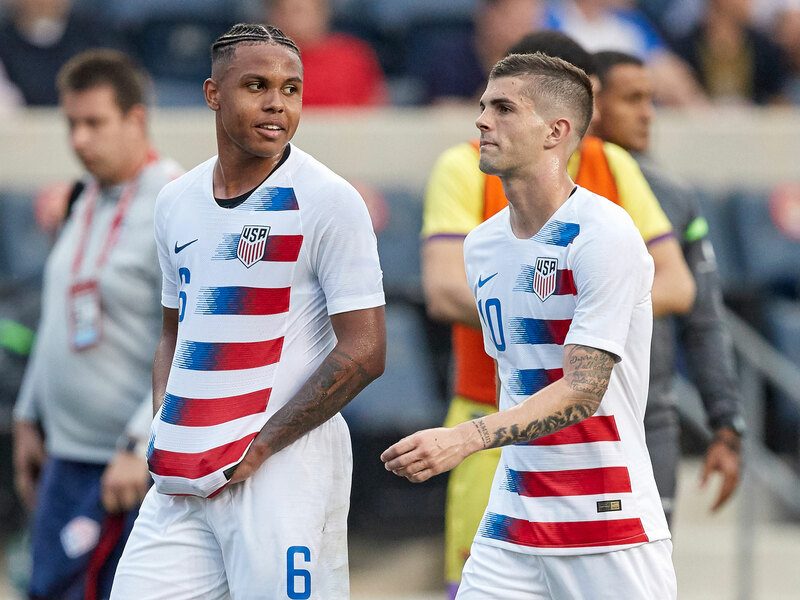 Pulisic, in particular, will be a key addition, McKennie says. Even though they play on opposite sides of the fiercest club rivalry in the Bundesliga, Schalke-Dortmund, the two 20-year-olds really are close friends. McKennie says they have even gone on vacation together twice in the past year, once at the end of last season to the Dominican Republic and once during last year’s winter break to Disney World in Florida. With Pulisic having played in just one game in 2018 for the national team, the U.S. has struggle to produce much in the way of scoring chances against difficult opposition. That could change this week. Increasingly, McKennie is as well for his teammates. But that’s not to say his education has ended. After breaking through at Schalke last season and qualifying for the UEFA Champions League, McKennie has seen Schalke struggle at times in his sophomore campaign. The team is currently in 14th place in the Bundesliga after a 3-0 loss to Eintracht Frankfurt. In Champions League, though, Schalke has eight points from four games and has a good shot to advance to the knockout rounds with Porto in Group D (ahead of Galatasaray and Lokomotiv Moscow). It was McKennie’s goal, in fact, that gave Schalke a big three points away in Moscow. It’s hard to imagine a better situation for McKennie to be learning in right now, though. He’s 20. He’s a regular in the Bundesliga and Champions League in addition to being a starter for the U.S. national team. Games this week against England and Italy are just two more solid opportunities to get better.